Nothing says "summer" quite like the smell of elderflowers. I've been meaning to start a series about foraging and wild food for a while, and the scent of these wonderful flowers in the heat of the last few days has reminded me to start it before I miss the season completely! I'll show you some more of my wild favourites over the course of the year, but I'm going to start with Elder. This generous tree gives twice, with its fragrant flowers in May and June, and then the rich, dark berries later in the summer. It is quite an easy plant to identify, growing as a low shrub or tree, often in hedgerows. The creamy white flowers grow in large, flat florets made up of tiny individual flowers. Be careful not to confuse them with umbellifers such as giant hogweed, these grow up from the ground on a single stem so are easy to differentiate when you look closely, although the flowers can appear similar at first glance. The video below shows the two side by side. The best way to tell you are definitely picking elder is to smell it! 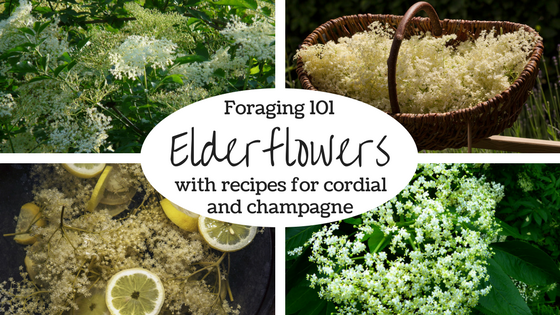 The sweet, honey-like scent is unmistakable if you have ever drunk elderflower cordial. Elderflowers are best picked on a warm, sunny day when their fragrance (and flavour) is strongest. Despite me filming this in the evening it is much better to pick the flowers in the morning if you can as they will small and taste nicer. You want to look for the fresh, white/cream flowers before they begin to turn brown. Don't pick all the flowers from any one bush, especially if there are not many bushes in that area. Apart from allowing the plant itself to reproduce, they are a valuable source of nectar for insects. If you leave plenty of flowers they will produce berries later in the summer which are another wonderful foragers' treat, and they are also very popular with birds. Try to avoid picking flower heads with clumps of white bubbles on them or underneath them. This is known as 'cuckoo spit' and is a protective hiding place for baby froghoppers. It tastes nasty (to prevent them being eaten by predators) so apart from not wanting to hurt these insects you also don't want it in your cordial! It is more frequently found on lower branches but it's always good to check as you're picking. Remove any visible bugs from the flowers, or leave them standing on some newspaper for half an hour for the bugs to walk off by themselves. You want to avoid rinsing the flowers as this will remove the pollen that gives the drinks their aromatic quality. For cordial; place the elderflowers in a large bowl with the zest of the lemons. I also add the lemon halves after juicing them and reserving the juice for the next day. Pour over 1.5 litres of boiling water (this will kill off the natural yeasts in the flowers so that the liquid will not ferment) and leave overnight. In the morning strain the liquid through a muslin cloth or tea towel (boil this for a few minutes first to sterilise it) into a large saucepan. Add the lemon juice and 800g of sugar and bring to a gentle simmer for a few minutes. Pour the hot syrup into sterilised bottles and leave to cool. It will keep for several weeks in the fridge. To serve dilute with water and pour over ice, or add a little to fruit salads. For champagne there is a slightly different process as you want to utilise the natural yeasts to allow it to ferment. This process can be very hit or miss, so if you prefer you can use boiling water to kill off the natural yeasts and replace them with champagne yeast. Dissolve 800g of sugar in 2 litres of boiling water in a sterilised fermenting bucket. Add 3 litres of cold water and allow the solution to cool. Add the zest and juice of 4 lemons and the elderflowers and cover with a tea towel. After 2-3 days check that the fermentation process has started, you should see little bubbles appearing. If not you can add some champagne yeast at this point. After another 4-5 days strain the solution through sterilised muslin into sterilised bottles. The champagne will continue to ferment for a few more days to produce a nice fizz and then will be ready to drink. Serve over ice, or for a special summery cocktail add a dash of framboise! Foraging is a great way to help you reconnect with the natural world. For some other ideas you can download my free guide on connecting to nature to improve your health and wellbeing here.